Long regarded as a tropical paradise for the wealthy European set, the Seychelles epitomize the height of island luxury with its temperate summer weather that attracts the snowbirds from the North. Its untouched and rather surreal beauty is spread amongst 115 granitic and coral islands in the archipelago located 932 miles from the East African coast where dramatic rock formations surround lush forests with white sand beaches and warm cerulean waters. 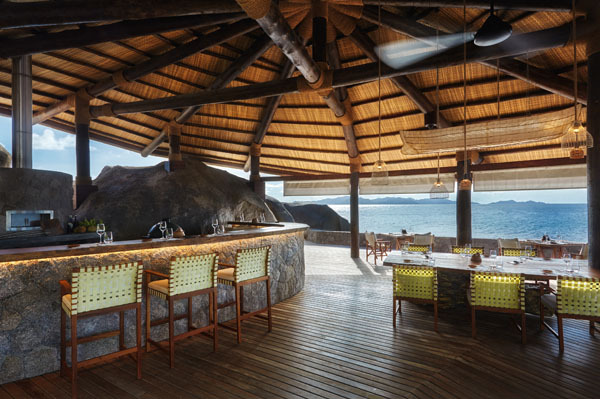 For those looking for private and secluded luxury, venture to the Six Senses Zil Pasyon located on the private island of Félicité, the fifth largest island of the archipelago, which is only 20 minutes by helicopter from Mahe. 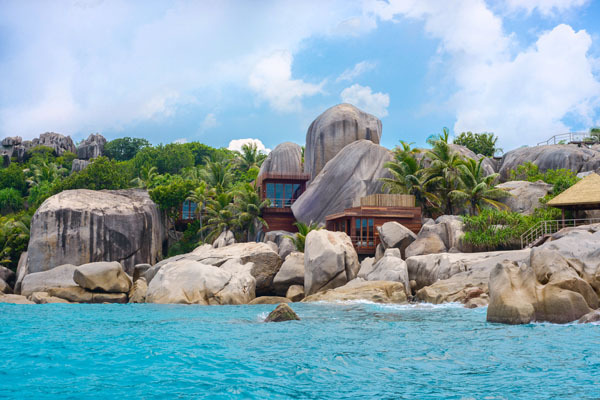 This exclusive resort is comprised of only 28 one bedroom villas and 2- 2 bedroom villas that pay homage to traditional Seychelles architecture and are strategically perched in the hillside to overlook the Indian Ocean and surrounding islands while ensuring total privacy with the surrounding vegetation. Each villa exudes island chic with floor to ceiling bow windows that open fully from the bedroom to an expansive loggia with a private heated infinity pool to immerse guests in nature or enjoy a personal climate controlled environment when closed. 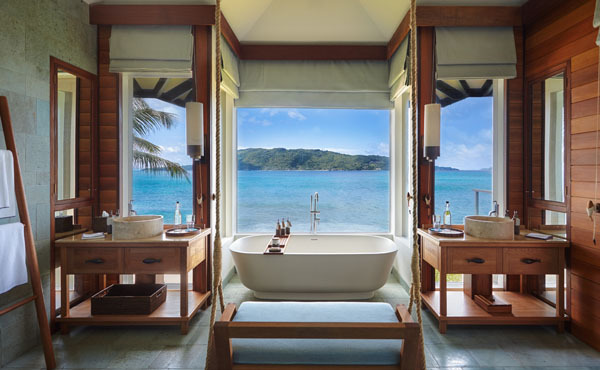 The spacious bathrooms feature soaking tubs with panoramic views or a rainfall shower with expansive closets and dressing areas. The development of the resort and its private villas has been carefully balanced with preservation of the natural surroundings. 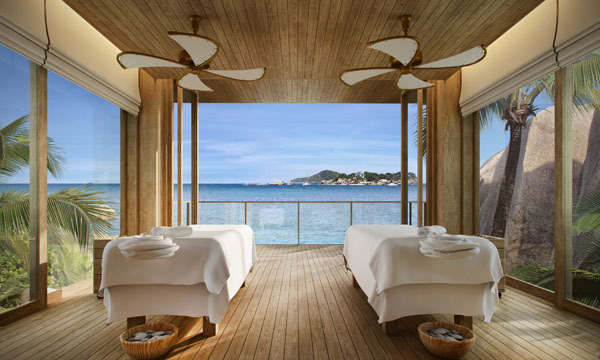 Relax and rejuvenate at the renowned Six Senses Spa that features five double treatment rooms spread amongst rocks, boulders and oceanfront views with different themes to reflect their individual settings. Choose from a selection of locally-inspired specialty treatments together with an extensive menu of signature therapies that blend holistic wellness with pampering treatments. Facilities include a yoga and meditation pavilion, sauna and steam, saltwater pool and a gymnasium with inspiring ocean views. The resort’s main swimming pool is set at the water’s edge with the ocean’s waves breaking over the rock wall. There are also three white sand beaches on property that are also home to the rare hawksbill turtles who come to lay and hatch their eggs. For the best underwater snorkeling experience take a 10 minute kayak ride to the neighboring uninhabited Coco Island. Swim with stingrays, exotic fish, and sea life in warm turquoise waters and enjoy an alfresco picnic on the white sand beaches surrounded by dramatic black granite stones. At the end of the day admire a sublime ombre sunset over the Indian Ocean at Sunset Point as the indigenous bats and terns fly above. Enjoy local Seychellois home style cooking with European, African and Creole influences at the Six Senses’ signature Island Café. Savor locally caught seafood delicacies at the Ocean Kitchen located by the ocean’s edge. For a taste of local Seychelles rum, Lakanbiz, located on the upper floor of the Island Café, offers flights of potent yet flavorful aged and infused rums. After dark enjoy an alfresco movie under the stars at their outdoor Cinema Paradiso evenings. 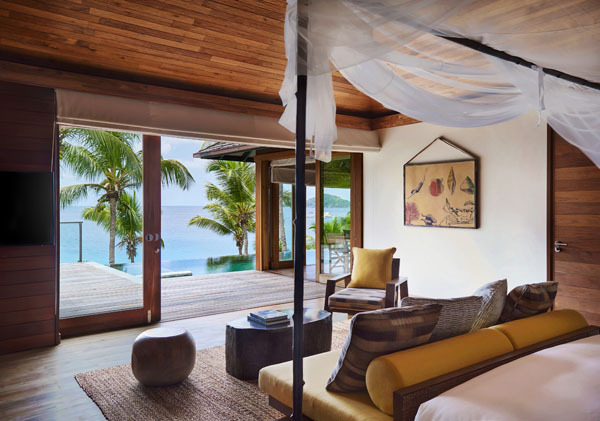 Whether it’s a romantic getaway or a bucket list vacation, the Six Senses Zil Pasyon offers a truly unforgettable holiday in an idyllic natural setting that is becoming an increasingly rare commodity. The best way to reach Félicité Island is via Qatar Airways through Doha that offers daily nonstop flights to Mahe. 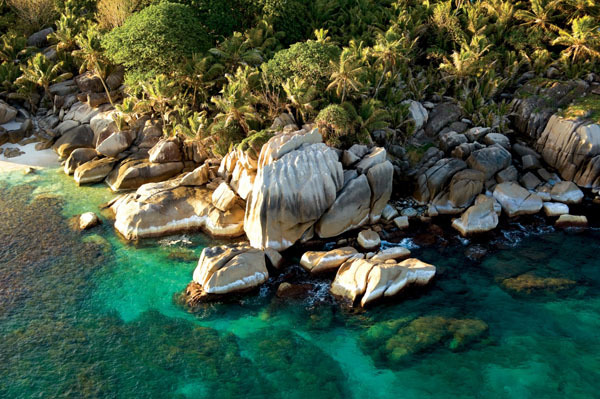 From there Zil Air operates direct private helicopter flights lasting 20 minutes offering gorgeous aerial views over the Seychelles archipelago.